Rangzen Alliance » WOESER: What Do They Mean When They Say “We Must Strive to See That the Reincarnation of the Dalai Lama is Produced Only Within the Country”? WOESER: What Do They Mean When They Say “We Must Strive to See That the Reincarnation of the Dalai Lama is Produced Only Within the Country”? Note: Several hours ago Phayul reported that the Dalai Lama has no plans to visit Hong Kong. That report seems very much to be in response to the blog post translated below which Woeser first posted at RFA and then put on her own website a few days ago. If one of the points raised in the post has thus been answered, there are others that also deserve consideration, particularly the point that China is very much concerned that a situation similar to what they now have with the Panchen Lama (i.e., two individuals designated as such, the official Chinese choice being largely rejected by the Tibetan population) not happen with regard to the Dalai Lama’s next incarnation. To that end, Woeser notes, China seems to be trying to manipulate the Dalai Lama and the exile authorities to accept that the next Dalai Lama will be born and recognized within China, in part by holding out hope for movement in negotiations and even a resolution of Tibetan issues. With that in mind, one may rightly wonder if the anti-democratic moves by the exile authorities, including the rejection of democracy as a Tibetan goal, interference from Tibetan exile leaders in the management of RFA’s Tibetan service, and, most recently, the effective castration of a cravenly apologetic TYC are supposed to be part of a reorientation meant to align the exile community with signals coming from China. What Do They Mean When They Say “We Must Strive to See That the Reincarnation of the Dalai Lama is Produced Only Within the Country”? There’s also one sentence that is absolutely revelatory: “Although we could use ‘The Golden Urn’ to restrict an incarnate child from being born outside the country, history also offers the precedent of an incarnate lama designating his successor. We must do everything possible to avoid the embarrassing situation of ‘twin Panchen Lamas.’” The Party School professor is too incautious: how could she have revealed the secret that it was Communist Party yahoos managing the “Golden Urn” ceremony who officially designated a “Fake Panchen Lama”? How could there be such a coincidence?! This is far too bizarre! Could it be that some sort of scam is being played? And what’s the background of this Hong Kong organization? Even though—contrary to what one might think—being a swindler and having a background of close ties to the Communist Party are very compatible, the question is: how could this sort of person have been allowed to extend an invitation to His Holiness the Dalai Lama to come to Hong Kong? How is this not extremely sinister? And that certain someone who is its founder? According to information supplied by an internet friend on Twitter he was the convener of the 2009 “Right to Inherent Dignity Movement Association” which at that time seriously disrupted the July 1st [pro-democracy] demonstration. 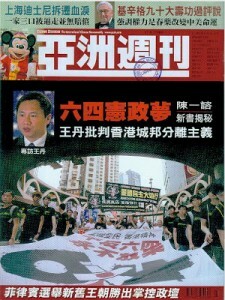 The Apple Daily reported that “it had fought over who had rented the Victoria Park site; and similarly along the march route, the same weird group was suspected of seriously disrupting the July 1st demonstration.” At the time the Voice of America also reported that he had wanted to go to Victoria Park to fight over control of the demonstration’s base area. 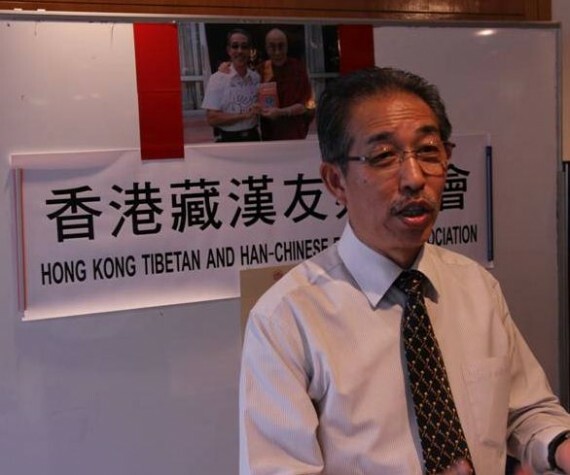 And now this person has become the founder of the “Hong Kong Tibetan-Han Chinese Friendship Association.” At the beginning of last year he travelled to Dharamsala and saw His Holiness the Dalai Lama. Afterwards he had a photo of himself with the Dalai Lama enlarged and showed it off all over the place. And most recently he declared that he had invited His Holiness to visit Hong Kong to preside over Buddhist teaching activities. He even claimed that he’d already received written approval for this from the government. But, as an internet friend said on Twitter, in previous years the Hong Kong Government had refused entry to Wang Dan; if it were now to allow the Dalai Lama to enter that would be really strange. So in the end, what is this all about? The heart of the heart of the whole thing lies in the wondrous nature of this Party School professor. Her first suggestion has already met with a fortuitous coincidence (whether His Holiness actually goes to Hong Kong is another matter; the coincidence has already happened). And as for her second suggestion—“We must strive to see that the reincarnation of the Dalai Lama is produced only within the country.”—does one dare say that it too will meet with a fortuitous coincidence? How is it that one feels that there’s a chess game in play, move by move? Ultimately, how should one “strive”? Who is the “we” of whom the Central Party School professor speaks? The Chinese language is just too rich. “Vis-à-vis His Holiness, who is already ‘advanced in years’ and who is facing an imminent reincarnation problem,” there must be “striving,” there must be “a resolution.” What do such verbal formulations signify? Indeed, don’t walk into danger! When there’s someone saying “We must strive to see that the reincarnation of the Dalai Lama is produced only within the country,” my hope is just for His Holiness to be in sound health; for His Holiness to be free of any malady! God, Sperling, what is the matter with you?